Our extra payment calculator is a great solution for anyone looking to get ahead by making some extra payments. Thousands use this extra payment calculator to significantly shorten the term of their mortgage. Homeowners regularly turn to our extra payment calculator thanks to its effectiveness and ease of use. Simply enter the values in the space provided, including your mortgage amount, interest rate and the amount of your extra payment. Using an extra payment mortgage calculator will help you reduce the term of your mortgage by years and result in noticeably significant interest savings. This extra payment calculator consistently helps people get control of their mortgage payments and can even cut the term of a home mortgage in half when used strategically. 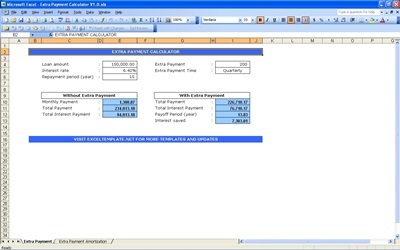 If you find this extra payment calculator useful, please feel free to share it with your friends or coworkers. We strive to offer the most useful templates, spreadsheets and payment calculators on the market and this extra payment calculator is no exception. Our extra payment mortgage calculator is available for free download and is ready to use instantly. Simply download the extra payment calculator and fill in the values. We think you’ll be amazed by how quickly you can pay off your mortgage. And remember, this calculator is great for any type of loan. Pay that car or your credit cards off quickly with the help of this extra payment calculator. grab your free extra mortgage calculator today and get started in minutes! And don’t forget to check back in with us. We are always adding new templates and calculators.